Bad Credit? 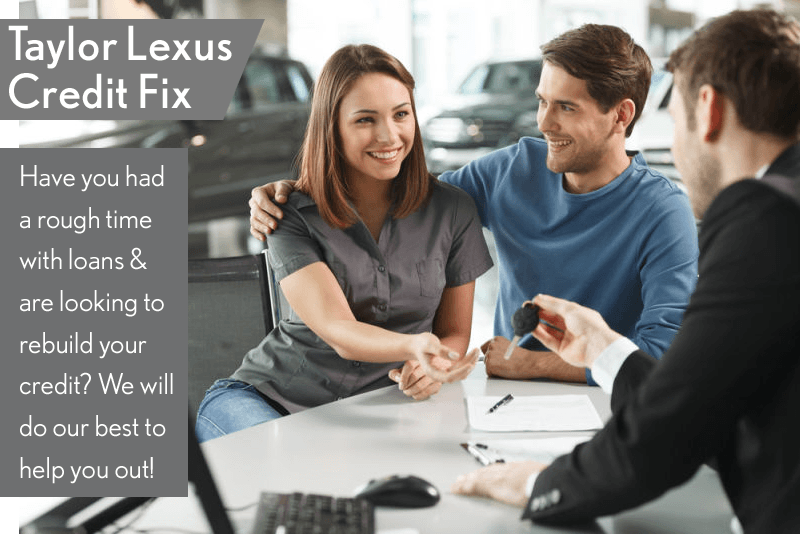 We Can Help @ Taylor Lexus Regina Lexus Dealer SK. At Taylor Lexus our finance department has 60 years combined experience in making dreams come true. We do not pre-judge any applicant and work diligently to obtain the best program to re-establish “bruised credit” so that eventually our clients may re-enter the mainstream of credit worthiness. We understand that bad things can happen to good people and we are here to guide our clients through the process so that they are able to drive away in a great car with warranty and that meets their budget. We also coach our clients in the best possible way to get back on the right track in the credit world. We deal with clients that have had credit problems due to illness, bankruptcy, divorce/separation from a spouse, loss of job and that had a great track record prior to an unforeseen accident with their credit. All applications are unique and are worked as a priority. All information given to us is held in the strictest confidence and complies with all privacy legislation. If you are frustrated with other dealers that just want to sell you a vehicle to maximize their profit rather than build a relationship that will last years, then you have come to right place! Please take a moment to fill out the on-line application. It is important to not apply anywhere else until we have completed our due diligence as multiple credit inquiries could have a negative effect in obtaining the best terms possible. I give you my personal guarantee that my team and I will work with all our financial sources to get you the best deal as well as guide you back to mainstream financing on the future. Our program is designed over time to give lenders the confidence in our clients to grant the best finance rates available. We look forward to serving you. To apply for financing, simply click the button on the upper-right hand side of this page.